A pre-offer inspection is commissioned by the buyer of a prospective property before the buyer makes an offer on the home. A pre-offer inspection is an on-site, in-person, visual assessment of the home. We look at the property's features and components and provide you with an honest appraisal of its overall condition. In competitive markets where including a condition of sale on a home inspection may make your offer less appealing than a clean offer to a seller, meaning no conditions; a pre-offer inspection is a great option. Clients are invited and encouraged to attend the inspection. ​We will provide you a full verbal report of all findings during the inspection along with repair needs and ongoing maintenance the home will require. As a homebuyer, you need reliable advice on the biggest single investment you may make. Not only should the property you want meet your expectations, it should be safe and offer no costly surprises in the future. 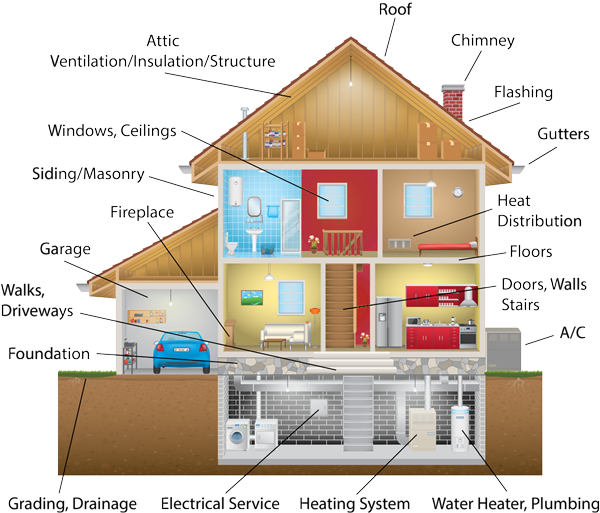 A Comprehensive Home Inspection looks at over 1,200 different items on our professional home inspector's list. Identifying deficiencies in some of these items could save you thousands of dollars. Spotting problems prior to purchasing a home allows a buyer to potentially renegotiate with the seller to adjust the price of the home to accommodate for repair of the deficiencies. It can also allow the buyer to gain an understanding of the cost of the repairs and therefore whether they want to continue with the purchase of the home. A Comprehensive Home Inspection also includes maintenance ideas and tips for ongoing care of your property to avoid costly repairs in the future. This inspection takes 2 - 4 hours to complete and a full, detailed, written report of the home's features and deficiencies is provided. Clients are invited and encouraged to be on site during the inspection where they are welcome to ask questions and learn about their potential new home. A seller's inspection or pre-listing inspection is conducted prior to a home being listed. It is a tool to identify what potential issues may be found if a buyer commissions a home inspection on the property for a condition of sale. If you are selling your home a seller's inspection will allow you to be ahead of the game and have the repairs identified and completed prior to sale. This could save an offer on your home from falling through due to unknown issues with the home. A seller's inspection may also allow you to conduct the repairs which may be more cost-effective than a buyer's contractor. ​This inspection takes 2 - 4 hours and the seller is encouraged to attend the inspection. A full, detailed, written report of the home's features and deficiencies will be provided. We are so happy that we chose HomeSure to do our home inspection. We bought an older home and we loved it at first site but we didn’t know what we might be getting into. Mark took us through the home from top to bottom and inside out. At the end we knew exactly what needed to be corrected and what didn’t. Mark’s inspection and the report was so thorough and detailed that we were able to negotiate with confidence and knowledge. We got the house and we’re very happy.